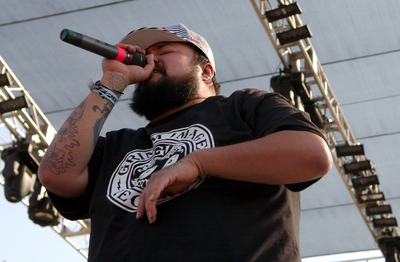 2mex, of the Visionaries, was the host of the March 28 2009 Paid Dues Festival in San Bernardino. He would freestyle, talk or shout out artists from the stage during set breaks. When newcomers Blu and Exile failed to show because of an accident on the freeway, 2mex and event organizer/founder/hip-hop artist Murs engaged in an entertaining freestyle. Why 2mex is not as well known lyrically for his freestyles, content and word usage (like hip-hop artist Big Punisher) has always been a mystery to me.